In short El Niño is a climate pattern that describes the unusual warming of surface waters in the eastern tropical Pacific Ocean. El Niño is the “warm phase” of a larger phenomenon called the El Niño-Southern Oscillation (ENSO). La Niña, the “cool phase” of ENSO, is a pattern that describes the unusual cooling of the region’s surface waters. In a normal year the winds blow strongly from east to west, due to the rotation of the Earth, causing water to pile up in the west of the Pacific. This pulls up colder water from the deep ocean in the eastern Pacific. In an El Niño event, the winds pushing the water get weaker and cause the warmer water to shift back towards the east. This causes increasing temperature in the eastern Pacific. But as the ocean temperature is linked to the wind currents, this causes the winds to get weaker and so the ocean become warmer, meaning the El Niño grows. This change in air and ocean currents around the equator can have a major impact on the weather patterns around the globe by creating pressure anomalies in the atmosphere. These disruptions to the normal air movements in the tropics also affect the mid-latitude jet streams, which is how El Niño can affect the weather in other parts of the world. The map above shows the near-real-time satellite observations of the temperatures in the Pacific Ocean in January 2016. Red color indicates warmer than usual temperatures and blue represent colder than usual temperatures. El Niño (ENSO) conditions have occurred at two- to seven-year intervals for at least the past 300 years, but most of them have been weak. El Niño affected pre-Columbian Incas and may have led to the demise of the Moche and other pre-Columbian Peruvian cultures. A recent study suggests a strong El Niño effect between 1789 and 1793 caused poor crop yields in Europe, which in turn helped touch off the French Revolution. The extreme weather produced by El Niño in 1876–77 gave rise to the most deadly famines of the 19th century. The 1876 famine alone in northern China killed up to 13 million people. The major 1982–83 El Niño led to an upsurge of interest from the scientific community. The period 1991–1995 was unusual in that El Niños have rarely occurred in such rapid succession. As shown in the diagram below, the strongest El Niño recorded was in 1997-98 with 2,3 degree warmer water temperature. In 2002-03 and 2009-10 the El Niño systems were “moderate”, but the 2015-16 El Niño looks similar in strength to the very strong 1997-98 season. Major El Niño events were recorded in the years 1790–93, 1828, 1876–78, 1891, 1925–26, 1972–73, 1982–83, 1997–98, and 2015-16 with the 1997–98 and 2015-16 episodes being among of the strongest ever. The El Niño’s warmer water feeds thunderstorms, it creates increased rainfall across the east-central and eastern Pacific Ocean, including several portions of the South American west coast. The effects of El Niño in South America are direct and stronger than in North America. An El Niño is associated with warm and very wet weather months in April–October along the coasts of northern Peru and Ecuador, causing major flooding. The effects during the months of February, March, and April may become critical. Along the west coast of South America, El Niño reduces the upwelling of cold, nutrient-rich water that sustains large fish populations, which in turn sustain abundant sea birds. The reduction in upwelling leads to fish dying off the shore of Peru. When El Niño conditions last for many months, extensive ocean warming and the reduction in easterly trade winds limits upwelling of cold nutrient-rich deep water, and its economic impact to local fishing for an international market can be serious. More generally, El Niño can affect commodity prices and the macro economy of different countries. It can constrain the supply of rain-driven agricultural commodities; reduce agricultural output, construction, and services activities; create food-price and generalized inflation; and may trigger social unrest in commodity-dependent poor countries. Extreme weather conditions related to the El Niño cycle correlate with changes in the incidence of epidemic diseases. For example, the El Niño cycle is associated with increased risks of some of the diseases transmitted by mosquitoes, such as malaria, dengue, and Rift Valley fever. Cycles of malaria in India, Venezuela, Brazil, and Colombia have now been linked to El Niño. El Niño conditions have also been related to Kawasaki disease incidence in Japan and the west coast of the United States, via the linkage to tropospheric winds across the north Pacific Ocean. 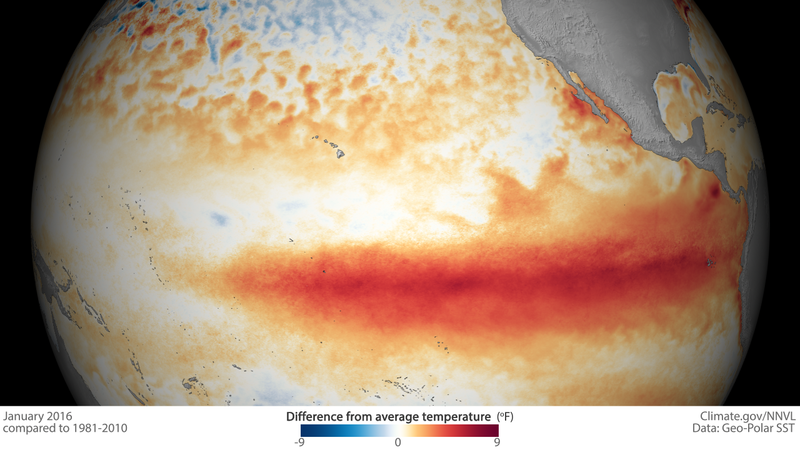 El Niño (ENSO) may be linked to civil conflicts. Scientists at The Earth Institute of Columbia University, having analyzed data from 1950 to 2004, suggest ENSO may have had a role in 21% of all civil conflicts since 1950, with the risk of annual civil conflict doubling from 3% to 6% in countries affected by ENSO during El Niño years relative to La Niña years. The effects on the marine ecosystem is complex and severe, especially in strong El Niño events. In 1998 the El Niño caused an estimated 16% of the world’s reef systems to die. The event temporarily warmed air temperature by 1.5 °C, compared to the usual increase of 0.25 °C associated with El Niño events. Since then, mass coral bleaching has become common worldwide, with all regions having suffered “severe bleaching”. El Niño can also heavily influence fish stocks, sea birds and sea mammals, especially if the events are appearing more frequently. Galapagos penguins are among the marine wildlife heavily affected by El Niño, since they breed on the western side of the Galapagos archipelago where an El Niño event hits hard. Usually the cold Humbolt stream cause upwelling, nutrition and healthy fish stocks around Galapagos. When the sea temperature rise, the fish dies or move further out and deeper in the water. The penguins have to use more time at sea and spend more energy per meal. This situation will cause starvation and lower breeding success, with serious impact on the Galapagos penguin population. In the two previous strong El Niño events in 1982-83 and 1997-98, 75 % and 66% of the penguins died. In normal years the penguins have slowly recovered, but only to less than 50% of what it was prior to the El Niño in 1982-83. When the new El Niño event is building up in 2015-16 less than 1000 breeding penguins is left to face the coming challenges. Some researchers have even raised the question if Galapagos penguins are the first sea birds in modern time that will go extinct as a result of El Niño. The Galapagos penguin has become a symbol of the El Niño, and the future for this species is not very bright with global warming and more frequent El Niño events. Other penguin species, like Humbolt and Magellanic penguins are also suffering during El Niño events. Even penguin species as far away as the Falkland Islands and South Georgia are believed affected by these cyclic weather changes. Monitoring the population of Galapagos penguins is important to also show the impact on the marine ecosystem in general. When the penguins are dying it also indicate the poor health of the fish stocks they are preying on. By monitoring the diving pattern of birds, it is possible to see how much deeper they must dive, and how far from the islands the fish stocks are located. By monitoring water temperature, researchers can also make good estimates on how serious the increasing sea temperature is for the marine ecosystem. 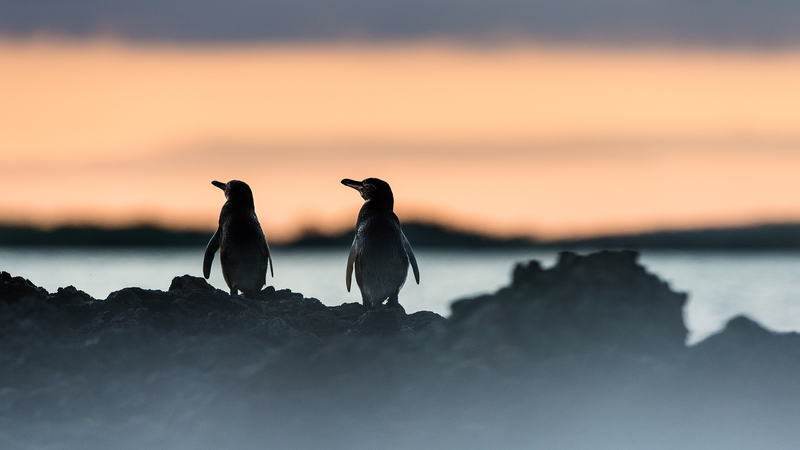 Monitoring the success and health of the Galapagos penguins is the same as monitoring the health of the Ocean in general. Many scientists believe El Niño is linked to global warming. However, comprehensive satellite data go back only to 1979, and more research must be done to confirme the correlation and study past El Niño episodes. In the previous decades the number of El Niño events has increased, although a much longer period of observation is needed to detect robust changes. The question is, whether this is a random fluctuation or a normal instance of variation for that phenomenon, or the result of global climate changes as a result of global warming. A 2014 study reported a robust tendency to more frequent extreme El Niños, occurring in agreement with a separate recent model prediction for the future. Several studies of historical data suggest the recent El Niño variation is linked to human driven climate change; in accordance with the larger consensus. For example, even after subtracting the positive influence of decade-to-decade variation, the amplitude of the El Niño variability in the observed data still increases, by as much as 60% in the last 50 years. Most likely a reduction in global warming will also reduce the negative impacts of El Niño.